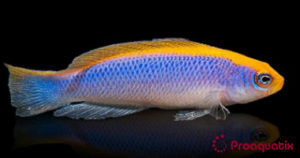 A powder blue-colored Dottyback with a yellow stripe that runs along the dorsal head and body and continues to the caudal fin. Pseudochromis flavivertex is a carnivore of worms and other small invertebrates. This species is often found in groups. Red Sea and the Gulf of Aden. This species is one of the least aggressive species in the genus. Usually ignores corals and most invertebrates. They may attack small shrimps but are useful to curb the proliferation of bristle worms. Proaquatix specimens have been weaned to take aquarium pellets and flakes. Freshly frozen invertebrates such as ocean plankton, Mysis shrimp, brine shrimp, and chopped squid will be readily accepted.